THE STERLINGTON COLLECTION PROUDLY PRESENTS "A TRUE MASTERPIECE"
Now is your chance to own one of the most famous ring designs in the world - complete with a stunning princess cut stone hand set in finished sterling silver plate. Even jewelers have a difficult time distinguishing the Diamond-z4 CZ from a mined diamond because of its similarity. Now for the first time ever, the fire and brilliance of flawless diamonds are captured in this beautiful ring! Each perfectly complemented by a brilliant setting of Sterling Silver Plate and offered at an unprecedented price! The Sterling Collection proudly presents a true masterpiece! This exquisite ring features a flawless two-and-three-quarter carat center CZ stone surrounded by over one-and-a-quarter carats of round and tapered clear Diamond-z4 CZ baguettes. Its style, luster, color, and cut are unsurpassed. Other similar rings can sell for thousands of dollars, but we're able to offer this amazing piece to the public for a VERY limited time for only $20 plus just $6.99 shipping and handling. EachDiamond-z4 CZ Ring is accompanied by a certificate of authenticity and comes complete with a hinged decorative velveteen box that will be shipped securely to your home. As part of our *SPECIAL OFFER, you'll also have the opportunity to receive the matching 1.9 total carat Diamond-z4 band for a separate fee of $6.99! This Sterlington Collection offer is not available in stores. Due to the limited time offer restriction, there is a strict limit of just one order per household. We urge you to reserve yours now. Order your-z4 ™ Diamond Ring now. When ordering today, you will receive the Diamond-z4 Ring for only $20 +$6.99 S&H, and as a special offer, you can add the matching 1.9 total carat Diamond-z4 Band with your order for a separate $6.99 fee. *State tax will be added to orders for: CA and NJ. 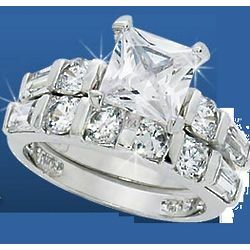 I ordered the Diamond Z4 ring for $20 and $6.99 s&h. It has been about a month and I still have not received the ring. Over the last two weeks, I have received two calls from their sales people to send me free earrings and a necklace for a 14 day free trial. If I chose to keep the necklace, I would be charged $53.96. I was not interested and told them so before they could even finish their speech. I was charged TWICE for $53.96 on the same day! I called my credit card company and told them the charges were fraudulent and they removed the charges. It's amazing to me that they think they can get away with ripping people off. This company is BOGUS!! !